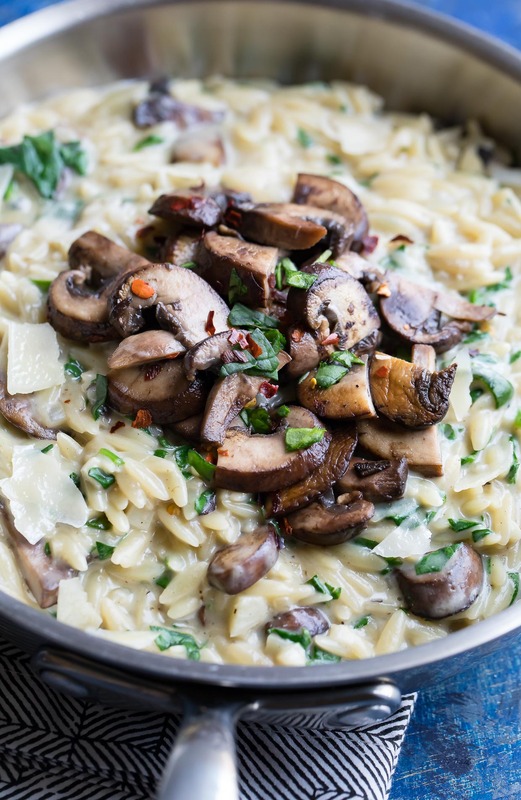 One-Pot Orzo Pasta with Garlic, Parmesan, and Mushrooms is a tasty vegetarian side dish that doubles as a main course and is ready in under 30 minutes! This creamy pasta is blanketed in a totally luscious sauce and swirled with veggies – love it so! I spend most of my mornings pacing around the house trying to figure out which random @$$ place I put my coffee this time. The rest of the day consists of re-heating my coffee, only to misplace it once again. This cycle continues for a comical amount of time until I remember to chug some water (for survival’s sake) and switch directly to wine. Between my coffee escapades and the fact that I’m no stranger to thinking I’ve lost my phone while it’s nestled safely in my hand, I’m certain I’m a few crayons short of the box these days. Wasn’t pregnancy brain supposed to be temporary? I feel like I’m still riding the hot mess train I boarded back in 2012 and can’t seem to get off. At least there’s coffee on the train! Mysterious vanishing coffee, but coffee nonetheless! Ok, ok, back to the food. Let’s talk about this risotto! I mean orzo! 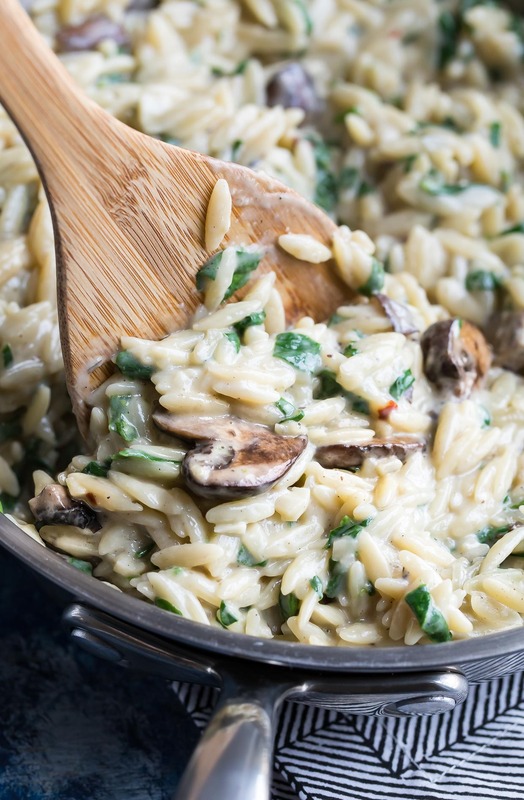 Both dishes are deliciously similar, with this creamy dreamy orzo being less starchy than a crazy thick bowl of risotto. There is also way less time spent stirring and babysitting here. In under 30 minutes you’ll be ready to dive in with your fork and call it a day. 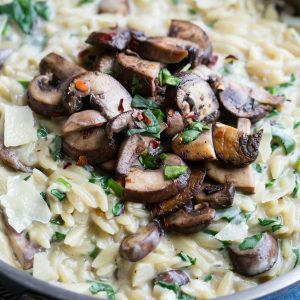 This creamy one-pot orzo pasta dish is blanketed in a totally luscious garlic parmesan sauce (made with no cream! sweet!) and swirled with fresh veggies. It’s one of those crazy comforting dishes that can be served up as a vegetarian main dish (adult mac and cheese anyone?) or as a scrumptious side dish for chicken or steak. We served ours alongside a leafy green salad – SO GOOD! This tasty vegetarian orzo pasta doubles as both a side dish or main course. 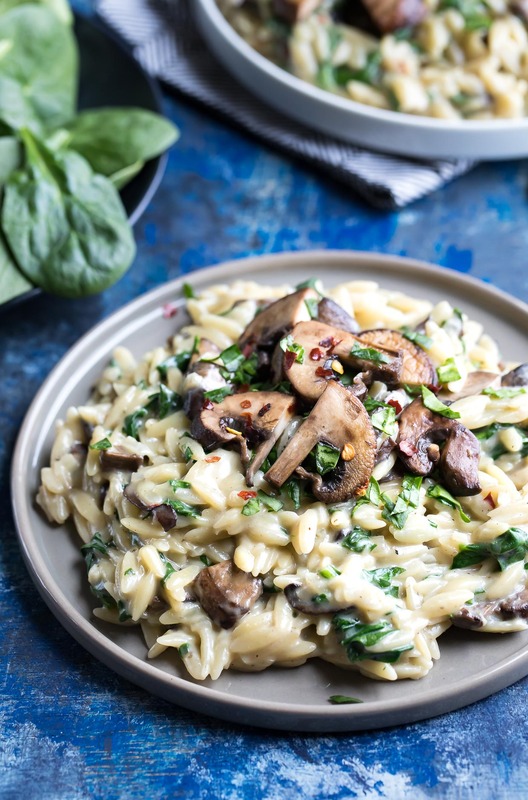 Serve it alongside chicken or steak or let it shine as as a grown up "Mac and Cheese" and pair it with a side salad for extra veggies! Slice mushrooms, cutting any extra large slices in half. Measure out remaining ingredients and set aside, this dish comes together super fast so it helps to have everything all ready to go! Melt 1 TBSP butter in a large pan (grab one that's deep enough for your orzo + sauce) over medium-high heat then add your sliced mushrooms. Sauté until tender, season with a small pinch of salt and pepper and red pepper flakes, then set aside. Add remaining butter to the pan and sauté your shallot and garlic until tender, adding the garlic towards the end to prevent burning. if extra butter is needed, feel free to add a little. Season to taste as desired, garnish with reserved mushrooms and any additional cheese your heart desires and dig in while it's hot! Regular button mushrooms will totally work here but if you crab crimini mushrooms (aka baby portobellos) they're for sure ideal and more flavorful too! Other small pasta shapes might work in place of the orzo, but it will likely alter the cook times and liquid measurements. I can't guarantee this recipe will work for different pastas without experimenting first. If you get a chance to try this tasty vegetarian orzo pasta recipe, let me know! Leave some love in the comment form below or tag your photos with @peasandcrayons on Instagram so I can happy dance over your creation. Can you make this ahead and re-heat? Hey Susan! You can! The only thing is, and this happens with most pasta dishes, is that the orzo pasta soaks up the sauce while it chills in the fridge. It does this quite a bit so it literally drinks up all the sauce and they gets extra fluffy and drier. I would maybe make some extra sauce to swirl in while you reheat or you can just stir in a little milk while reheating it and then adjust the seasoning to taste based on how much is added. I’ve used both methods! So easy , quick and fantastic!!! We experimented in different serving bowls. One we Added caraway seed. Another bowl had a dash of nutmeg . And the 3 rd bowl was as recipe is. All 3 good. But the kids liked no added spices. Delicious! I add in a bit of heavy cream. This was delicious!! I made this as a side dish for my family and they loved it. It was simple and quick and I will be making it again!! Whooo! So happy y’all loved it Deborah! Thanks! Actually, I forgot, I did modify a little to make it vegan. I left out the parmesan (used the cashew cream in lieu of) and used almond milk and plant based butter. SO AWESOME! I’m stoked the swaps worked and that you enjoyed the recipe. Thanks Rebecca! Just made this dish. So yummy!! And ridiculously easy. I made it a little creamier by adding a homemade cashew cheese sauce. Other than that, no modifications. Already planning to make again for my next friend dinner night. I sent a picture to the group saying it’s our next meal, they’re drooling. Just made this last night and it is super yummy! Used cashew milk and that worked great, too. I will make this again, for sure. Replacing coffee for wine! I love it! Adulting forreal. This dish looks like it pairs very well with wine! It also looks very creamy and is a dish that I’m excited too make. It’s a daily struggle, lol. Excited for you to try the recipe! So easy and so good! Will be a repeat at our house for sure. We had roasted chicken thighs alongside. Thanks for this great recipe! So happy you enjoyed the recipe, Carrie! Thanks! Yumalicious. This one is a definite keeper! My husband and teenage son agreed with your description of ‘mac and cheese’ for grownups. It was creamy, dense and full of flavor. I am making one change for next time: doubling the batch! Ahhhh yay! 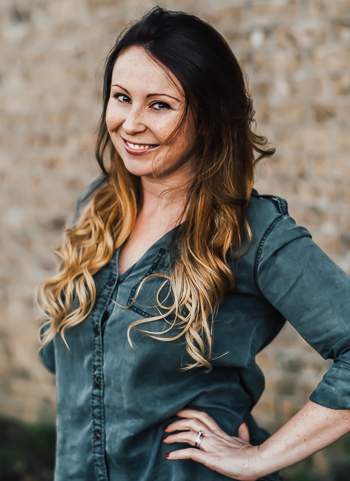 So happy y’all enjoyed it – thank you Julie! I made this for dinner tonight, it was delicious! Made this tonight. Great dish!. Next time thinking to add some asparagus instead of spinach. Have lots of friends who have given up meat for Lent, this was a great vegetarian dish. OMG I laughed so hard at your coffee comments. I thought I was the only one who did that. I have to say I reheat my coffee so many times before finishing it after I have found it again. Then once I feel my lips chapping by the afternoon remember I need water. Thanks for the good looking recipe and the morning laugh. I’ve made this twice now, and I LOVE IT!!! Such a wonderful dish!! Thank you for sharing! So stoked to hear it Stephanie, thank you! I made this and I have to say, YUMMMM! I have so much left over and I am excited to eat it again today!! Everyone has to try this. All of this looks like total deliciousness on a plate. 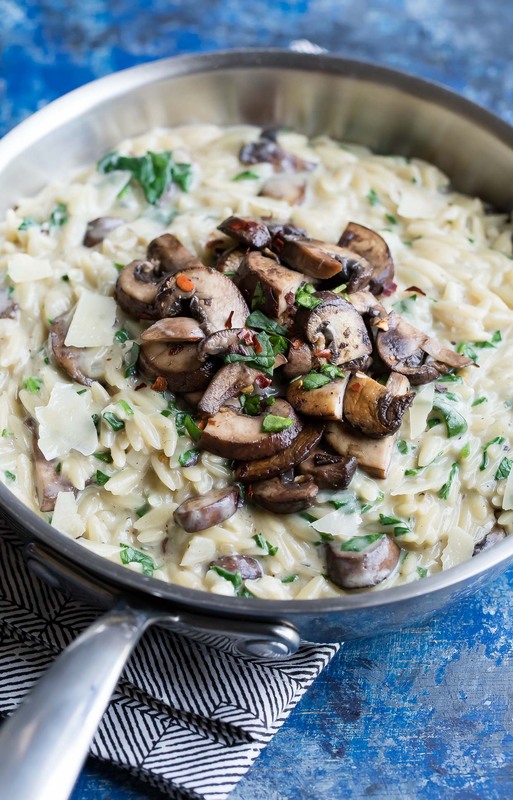 I love orzo pasta and a garlic Parmesan sauce and mushrooms just makes it that much better! Well done! Thanks Matt! It was seriously so good! We’ve already made it twice in one week! This looks so delicious and creamy. I can’t wait to try it. I can relate to your lost coffee and lost phone situation. Since having kids I lose everything too. And I keep thinking – it can’t have left the house, it must be here somewhere! So excited for you to try it Winnie! And yeah it’s totally maddening trying to find all the random places things are left in a fit of mom brain. I’m pretty sure I put dry pasta in the freezer at least twice and once tried to put the dishes away into the fridge… lol!